MINI Cooper Forum > Model Specific MINI Forums > MINI Countryman > Retro Fit MFSW - Cruise Control - CHEAPLY! Retro Fit MFSW - Cruise Control - CHEAPLY! A little helpful tip for everyone wishing to add Cruise Control to their standard 2 spoke steering wheel Countryman. On the cheap!!! I had a 3 spoke, multi function steering wheel laid around after breaking a Countryman. I always wanted to fit this onto the better halfs Countryman, which did not have cruise control from Factory. After removing the two spoke steering wheel, I noticed the squib had the connection for the MFSW. Now all I have to do is, get a MINI dealership to code the CANBUS. 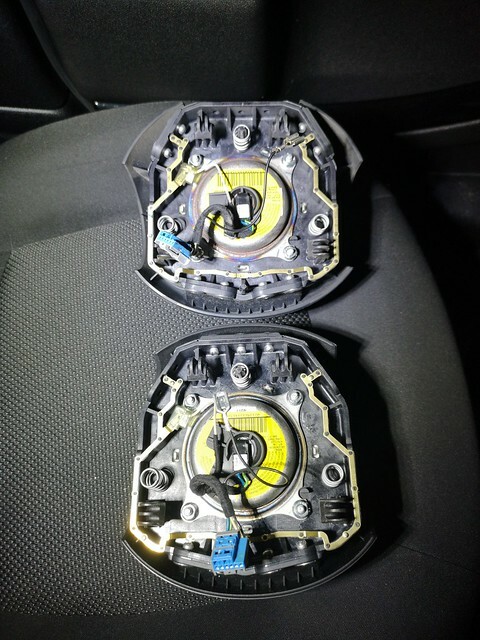 Depends upon the year, pre LCI cars may or may not have the correct steering column switch (part with indicators/angle sensor) and if not, needs changing because the connector is there in them all but the part in those cars most likely does not have the internal connections for MFSW. (ask me how I know - ). The coding can be done using NCS Expert but it is a PITA, probably worth an hour charge at dealership. I have a 2011 r55 I wish to retro fit this to. I have now got the 3 spoke steering wheel and the column switches (with auto h light function) . Once I get the airbag am I right in thinking once fitted to the car all I need to get it to work is the re program from main dealer??? Is there a way to get the correct szl number required . realoem.com will give you the most recent part number and as it says in that catalogue, all SZL units are now prepared for MFSW connection. I bought mine from somewhere in Holland online, new old stock I believe. Prices vary vastly. I have this szl scudder 6131-3451887 -03 but am unable to find it on the parts list. Is this a good one to use or a duff re cruise . This is from Realoem.com but may not be exactly your vehicle as not enough info (ie normally aspirated or S, US or Euro, etc). Go in yourself and this part is under 'Vehicle Electrical System'. There are diferrent part numbers depending upon your vehicle specification, rain sensors or not, etc.